Bright Wedding Versus White Wedding? While Meghan Markle was busy tying the knot with Harry over at Windsor Castle, my latest bride, Liz was marrying her Prince Charming, Adam in the grounds of an amazing Georgian wedding venue, Gray’s Court, in the shadow of York Minster. As predicted, Harry and Megs went for understated subtle white tones with their wedding flowers (yes, I know the huge arch was bloody amazing!) where as Liz and Adam went full on with colour at their ceremony on Saturday. Such a fun wedding to do! tons of coral and pink peonies, Miss Piggy roses and other bold and bright blooms, crazy sticky uppy cake flowers and a 72 foot table runner created just 1 hour before the guests rocked up! 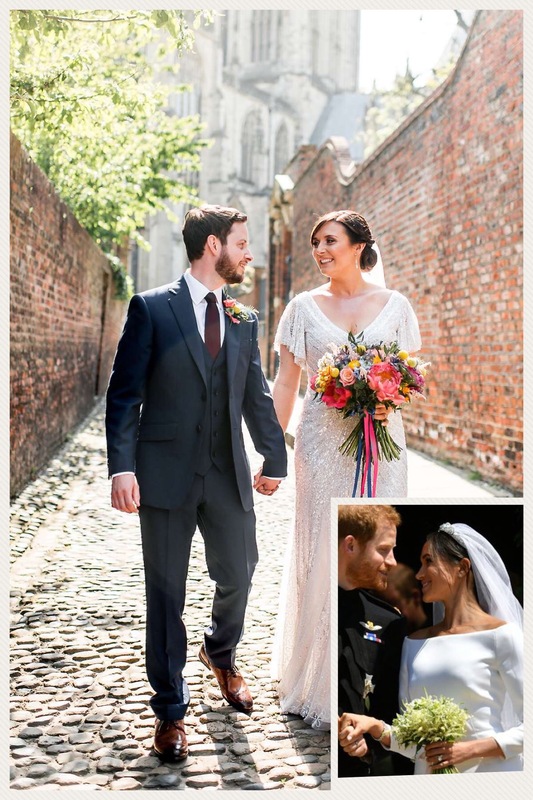 Worked with fab suppliers including Joe Dodsworth, who took this photo of Liz and Adam…… And to top it all off the sun shone brightly too!